To recycle your food waste, even in the winter? 100% natural growth enhancer every month? Then the Captain Compost Bokashi Method is for you! Using an anaerobic fermentation process, the Captain Compost Bokashi Bucket Composting System recycles ALL your domestic kitchen waste into valuable soil conditioner, what we like to call “good dirt”. Bokashi is a pleasant smelling product which you add to your bucket and which aids in the fermentation process. The food waste will not breakdown or decompose into soil inside the bucket. To complete the process you must put the fermented food waste in the ground, a plastic storage container (with dirt or other carbon material), a compost bin or large planter. Kitchen food waste composts in an air tight container using Bokashi as an inoculant, or compost starter. Bokashi is a Japanese term that means “fermented organic matter. The bokashi we make here in Great Falls is a wheat bran-based substance that has been inoculated & fermented with EM•1® an Effective Microorganism liquid concentrate - and dried for long-term storage. Simply place your kitchen waste in the bucket, sprinkle a small amount of the mixture over the waste, slightly compress (with a plastic bag) and reseal the container. The beneficial microbes immediately go to work to ferment the food scraps, releasing valuable nutrients and enzymes, without the problems of odor, heat or insects. The organic material does not breakdown, it pickles. You will have a vinegar smell, similar to other fermentation processes. Use approximately one handful of Bokashi to every 3–4 inches of food. Repeat this layering process until the bucket is full, then top with a generous coat of Captain Compost Bokashi. After fermenting for 14 days in the tightly-sealed bucket or other container, the waste can be added to an existing compost pile, buried directly in your garden, or placed in a plastic storage container or old cooler, making your own soil factory. After 2 - 4 weeks, the majority of the waste will have broken down into rich, nutritious soil which you can plant on top of or spread around the rest of the garden. There are some foods that will not completely break down in that amount of time (citrus rinds, for example), but will eventually. If you do not have a compost pile and need to dispose of your ‘fermented” material, please contact Sunburst for the location of a community compost bin or garden near you. "I have had great results with Bokashi in my area of Wyoming, where temps drop to 40 below. By June my compost is broken down and ready for the garden." "We use it our septic system and have for two years now. One treatment lasts three to four months for two people." "I have eight cats that I have taken in and twelve cat boxes. Bokashi takes the smell away." You can purchase your own plastic food-grade buckets with a tight fitting lid at local hardware stores, or purchase a bucket from us. 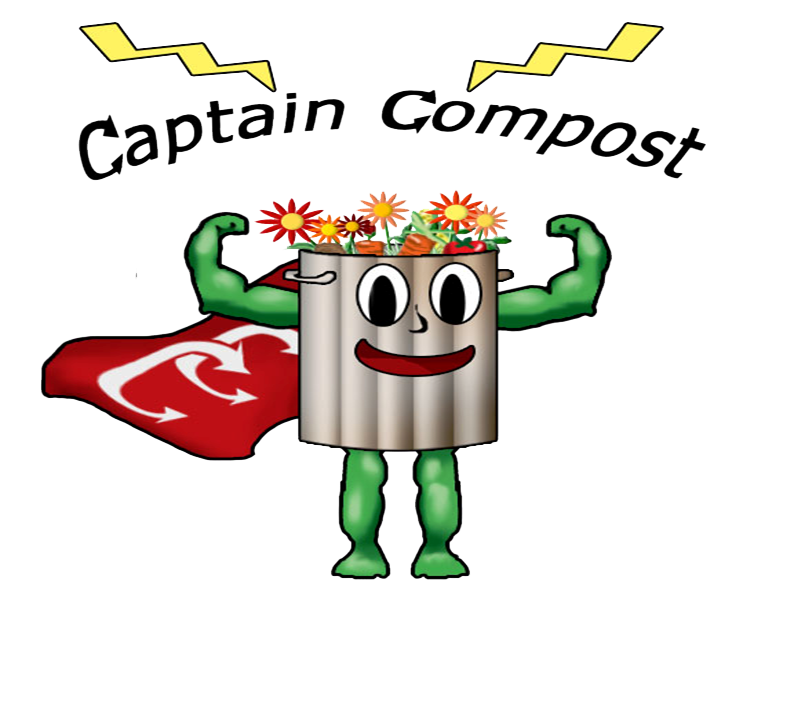 Buy Captain Compost Bokashi from the Captain's Store, by calling Sunburst Unlimited 868-2359 or at 2J's Fresh Market in Great Falls. Price: $4 for 1 quart dry bokashi, $12 for a gallon. For a purchase of bulk bokashi, contact Captain Compost at the number above. 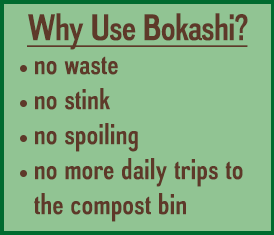 Always store Captain Compost Bokashi in a warm dry place out of direct sunlight. A kitchen cupboard is ideal.